There are many different types of wigs and toupées available to cover hair loss. The decision to use a wig or toupée and the type that you choose will depend on the type of hair loss you are suffering from its location, and its severity. There are also many other angles to consider before buying a wig or toupée, such as your current hair colour and style, and your level of activity during daily life. Human hair wigs – these are wigs that are made of human hair. 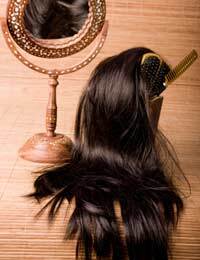 The human hair is donated or sold to the wig manufacture from many sources. Although these hair loss coverings can look quite natural they are more expensive than synthetic choices. Toupées – this is the term used to describe a small wig that is typically used to cover Male Pattern Baldness (androgenetic alopecia). These bald spot coverings can also be manufactured with human hair or synthetic hair. Synthetic hair wigs – these are wigs that are made of artificial hair. Since the hair material is created artificially these wigs come in a wide variety of colours, textures, and styles. They are also much less expensive than human hair wigs. Weaving – this is a type of hair extension that is placed permanently on the head by weaving or braiding. The extensions can be purchased to match the colour of your existing hair and you usually have a choice of Synthetic Or Human Hair Strands. Hair bonding – this is a type of wig in which the replacement hair is bonded to the natural hair in a process similar to weaving. However, in this process the attachment is done with a special type of glue instead of braiding. Now that you know your options, it is best to analyse the pros and cons of permanent wigs and toupées as well as those that can be taken off at the end of everyday. There can be many benefits to having a permanent wig or toupée, including the decreased risk of the hairpiece falling off during activities and causing embarrassment. With many permanently placed wigs you can swim and take showers without this concern. However, one of the negatives of this is that the wig or toupée can become damaged or faded over time due to chlorine exposure, sun exposure, or repetitive washing. Another downfall of permanent placement wigs is that the application process can be somewhat painful, and, in rare cases, lead to infections on the scalp or in the hair follicle. In order to combat this side effect some wigs are held in place permanently by wire loops that are stitched into the scalp. Others can be permanently attached through a process called “tunnel grafting". In this method, pieces of skin are cut out and make living loops for the wig. In either case, however, cleanliness of the area can become an issue, and some pain or infection can occur. If a permanent type of wig or toupée does not sound right for you, you can look into purchasing its temporary counterpart. Temporary wigs and toupées can offer many benefits to the wearer, the most valuable benefit being versatility. With a temporary hairpiece you can change the colour, style, length, and even texture of your hair anytime that you want to without much difficulty. Plus, since traditional wigs and toupées are typically held in place with tape or glue, they provide a longer usage life and are less susceptible to fading, damage, and wear. Another benefit is price. Temporary hairpieces usually cost much less than permanent alternatives. The main drawbacks to choosing temporary hairpieces are increased inconvenience (they must be removed before showering, swimming, and vigorous activity), ill fit (since the hairpiece is not permanently placed it can move around or be applied incorrectly), and embarrassment (a temporary hairpiece may come off at inconvenient or embarrassing times). If you will be buying a wig or toupée to cover hair loss, you will want to choose the best one for you. When deciding which type will work best for you, you need to evaluate your needs. Is your hair loss permanent or temporary? Do you swim and enjoy other physical activities that might make your toupée or wig fall off? Do you like changing your hair colour or style often? Is cost a factor for you? By considering all of the above questions honestly, you will be able to choose a wig or toupée that is right for you, allowing your hair loss to become less noticeable, if not insignificant. For more advice on maintaining your wig, read our articles Styling Your Wig and Washing Your Wig.